“And what are you reading, Miss—?” “Oh! It is only a novel!” replies the young lady, while she lays down her book . . . . Now, had the same young lady been engaged with a volume of The Spectator, instead . . . how proudly would she have produced the book, and told its name . . . . Substitute “a chapbook” for “a novel” and Interview for The Spectator, and little has changed since then. Of course, Austen wrote for readers who would appreciate this point of view, who would get the joke – and, just as the problem remains the same today, such readers are still around too. It’s not that one wants poetry alongside ads in the glossies, these readers will tell you, but it might not be so bad if the ideal situation were the ordinary one: if fine poetry editions were as accessible as mainstream stuff, no big deal. When Ben Fama writes, in a poem called “Tumblr Skies” midway through his new collection Odalisque, “I’d like to perform something / not dominated by industry,” one gets the feeling that these readers are his people, and that they’re paying attention. Traveling unmolested among the general populace in Ben Fama’s poems, so to speak, it dawns on us, facing the dullness and callousness of existence, that we aren’t responding to our fellow humans in kind, but rather that we’re addressing them with a fabulous civility. you are interested in moving to. Saturate the market with your resume. During interviews order both coffee and juice. obvious to all parties six months into the job. something that most people wouldn’t dare play with in couture design. When Gaultier talks about himself though he sounds dumb. In this least alienated of poems, modernity is neither a place to hide nor a clearing-house for ready-made metaphors, but a quandary shared as part of the common lot; and because of this, contemporary realities can be treated good-humoredly and with respect for the reader’s intelligence. The jocular tenderness of this formal declaration of intimacy ushers in a meditation upon mortality that briefly reveals the other side of its author’s joie de vivre (“I will die / Under conditions / Premeditated by myself”); and, all the lightness, tendresse and culture appear in their proper light as the things which make life worth living. There are poets who give one the impression that they see everything as if through their own semitransparent reflection in a pane of glass which precedes them by a few feet at every turn. 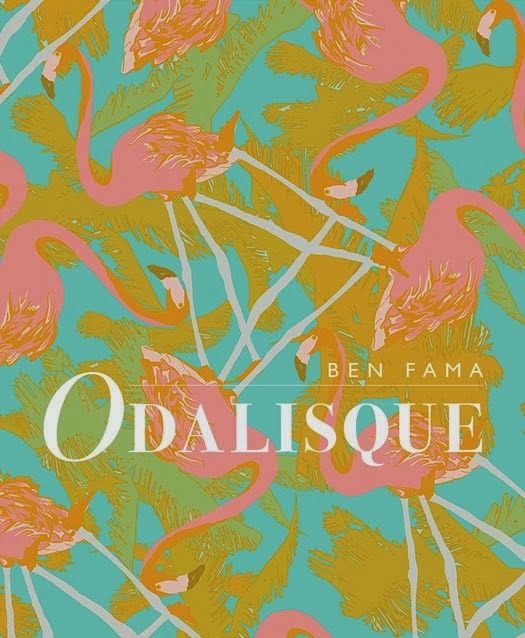 By contrast, Ben Fama’s poetry greets the violence of contemporary life with a sophistication that needs no defense or attack; Odalisque’s practiced poise doesn’t come off as studied, but as a disarming ease, even at its most challengingly elegant. The truth is that everyone reads everyone, regardless of status; you beg, borrow or steal, if necessary, to keep your hand in the game. Understandably, perhaps, the contentious nature of American public life, with its din of competing interest groups, takes its toll on the poetry world (how could it not? ); and, as apparently is not the case with many other disciplines, infighting among poetry devotees all too often results in a confusion of pronouncements that’s tantamount to bickering – with no agreement even as to the terms of the conversation, and with posturing on all sides – rather than being productively transformed by the work itself. In the rare poetry which rises above such internecine divisions, one finds a refreshingly frank acknowledgment that we’re all wholly unknown to each other, in the gray area of daily life – and that even so, it’s all good, as they say. The seven poems in Ben Fama’s Odalisque (no matter that they appear in an edition of only a hundred copies) achieve such transcendent scope.